I was walking out of the grocery store today and I could not resist this adorable little rosemary tree! I have never taken the time to shape my rosemary plants and I thought this was such a wonderful way to display this herb! To keep the shape I will trim branches off to use to keep the original shape. 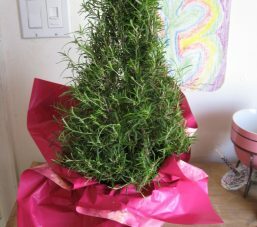 So what does one do with a rosemary tree? Note: I didn’t copy this list from anywhere. These are actually the things I use rosemary for every day! This is one of my favorite herbs! 1. Rosemary is good for the memory. Sniff some if you loose something around the house or can’t find your car keys. 2. Rosemary is good for keeping you alert. Sniff some if you start to nod off during the day. This might be a good plant to keep by your computer if you work in an office. This would also be the ideal plant for a college dorm room. 3. Rosemary is refreshing in the summer. One of my favorite drinks is rosemary lemonade. Take a sprig of rosemary, put it into a pitcher of lemonade and let it sit overnight. 4. Fresh rosemary is amazing in a roast. Put it into the crock pot with your roast and prepare to be dazzled.Two 2-inch sprigs are enough for an entire roast. 5. Rosemary is an anti-depressant. If you are having a low mood rubbing a branch and smelling it should help. If that is not enough you can drink a cup of rosemary tea or put a couple sprigs in your bathwater. 6. Rosemary is a wonderful solution for dandruff. Put a few sprigs in a sealed bottle with some sprigs of mint and vinegar. Use as a hair rinse twice a week. 8. Rosemary is a refreshing, healthy and revitalizing facial treatment. Put a few sprigs in a pot, simmer and lean your face over the pot (put a towel on your head and around the pot to keep in the steam) to give yourself a facial. 9. Just sitting there Rosemary is a natural potpourri for any room. 10. Having herbs around the home is very educational for the children. They like to smell them, make tea from them and touch them.